The Sanchis was first manufactured in Seine (France) in 1906. 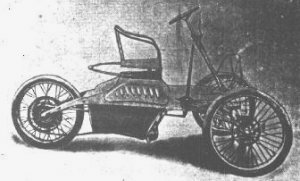 The vehicle was first shown at the 1906 Paris Salon and was a two-seater with a unit construction of body and chassis. Towards the end of their manufacture in 1912 the vehicles were sold by L Pierron in England under the “Mass” name. The original vehicles were powered by 4.5hp engines though this had increased to 10hp in later models.